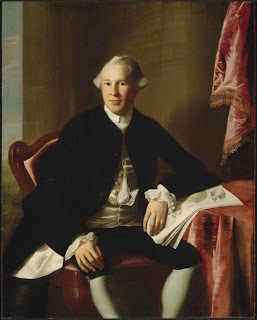 Dr. Joseph Warren was an important figure at the dawn of the American Revolution. A physician in Boston, he became an influential figure among the patriots who opposed British tyranny. He was appointed Major General three days before the Battle of Bunker Hill, but instead let the more experienced generals take command. Warren was killed in the third and final British assault during the battle on June 17th, 1775. Dr. Warren was a very eloquent orator and writer, who did much to fan the flames of liberty in Boston. 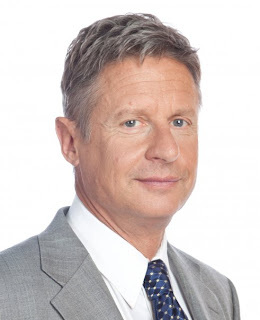 "I would have such a government as should give every man the greatest liberty to do what he pleases consistent with restraining him from doing any injury to another, or such a government as would most contribute to the good of the whole, with the least inconvenience to individual." Let me preface this with a disclaimer: I was not a supporter of Ron Paul's presidential campaign in 2008, nor do I envision myself supporting him in 2012, should he run. I think that Paul is right on a lot of issues, but I disagree with him on a lot of his positions. I've never been thrilled with Paul as a presidential candidate. Treasury Secretary or Federal Reserve Chairman, perhaps. President? Not so much. Now that I have that out of the way, on to the point of this post. 2012 is going to be a very interesting presidential election, particularly on the Republican side of things. Ron Paul made a splash in 2008, but didn't really get anywhere. 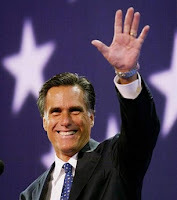 His supporters, perhaps the most loyal and zealous of any current politician, have been pushing for the 75 year-old to run again in 2012. Paul has hinted that he is considering another presidential run. But, to add a strange twist, his son, freshman U.S. Senator Rand Paul (R-KY), has also expressed interest - but only if his father doesn't run. Rand is considered by some to be a more palatable, less extreme version of his father. Others don't see a dime's worth of difference between the two. So, I've decided to do a poll on the subject. If you had to pick between Paul's, which family member would you consider supporting for President? Ron? Rand? Robert? Would you not support a Paul? Vote below, and check back for results as the votes are cast. P.S. After voting, click See Dashboard to view more detailed results. 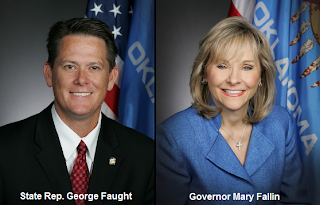 OKLAHOMA CITY – Governor Mary Fallin has signed into law House Bill 1044, a measure requiring legislative approval of rules changes related to fee increases and scope of practice issues. The bill was signed into law Thursday. In her State of the State address, the governor called for more scrutiny of new rules and regulations. 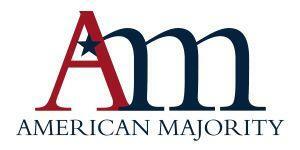 This Saturday, I will be participating in a local blogger panel at an American Majority training event. 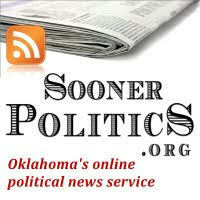 Joining me will be bloggers Michael Bates of BatesLine.com, and Peter J. Rudy of OklahomaWatchdog.org. Our nation was founded by ordinary citizen activists desiring a government that was accountable to the people. Today, ordinary citizens in every citizen and in every community are tired of the status quo and are ready to get involved like they never have before to demand accountability. American Majority’s purpose is to address these passions by providing education and resources to help you reach your goals. To that end, American Majority desires to challenge concerned citizens to turn their focus to state and local issues with the first annual Tulsa Battlefield Training. First, the Tulsa Battlefield Training will give those in attendance a clear picture of what is happening at both the state level and local level with government spending, waste, and clear explanation regarding how all levels of government got into this mess. 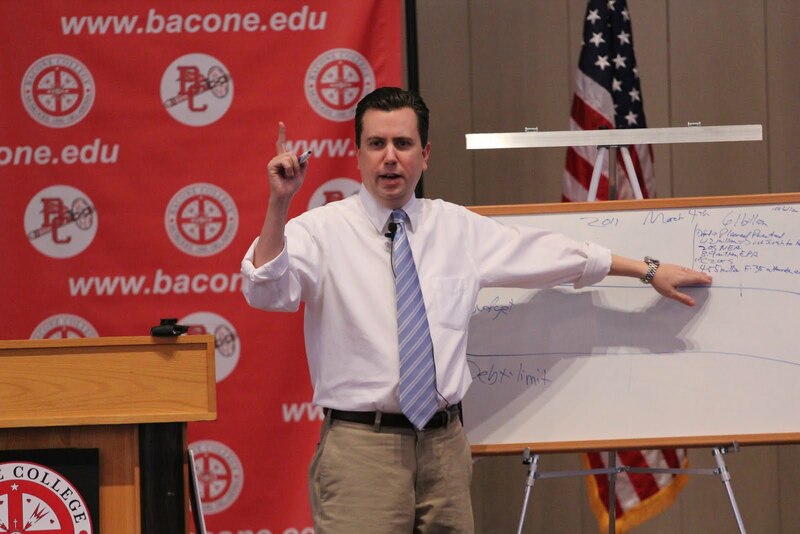 Secondly, the Tulsa Battlefield Training will also provide tool, resources, and specific ways that attendees can get involved in the local government structure – whether as informed citizen activists or candidates for local office. The Tulsa Battlefield Training will take place on Saturday, April 23rd at Tulsa Technology Center located at 3420 S Memorial Dr. from 9:00 am to 4:00 pm. Doors open at 8:30 am. Registration is $20 per person (which includes lunch and all materials) - space is limited. Click here to register online. If you have any questions or would like additional information, call Seth Brown at 405-639-8896 or e-mail him at Seth@americanmajority.org. This will be a great event; I highly encourage you to attend if at all possible. 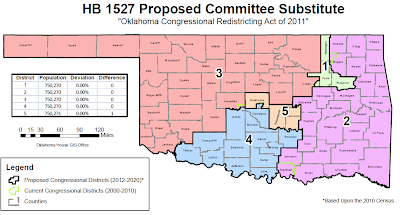 The above is the proposed Congressional Redistricting map, as rolled out today by House leaders. McCarville has the full press release here - you can view more maps and details at the House Redistring page here. For local interest, the 2nd District picks up most of Rogers County that was in the 1st District, although the Owasso area still remains in the 1st. 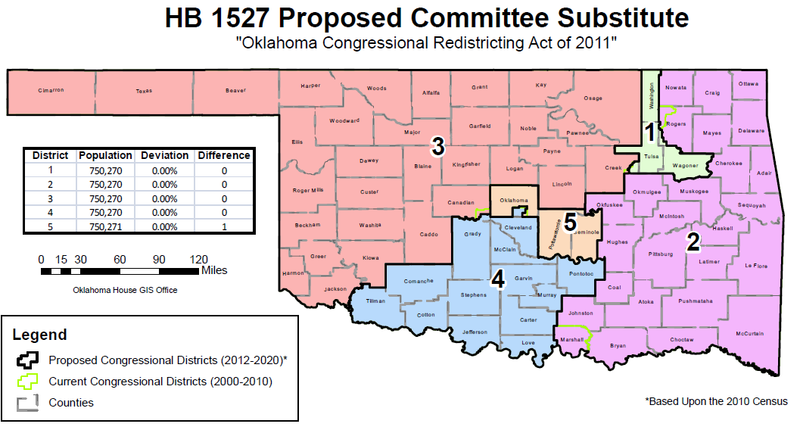 Marshall County is transferred from CD4 to CD2. 12 freshmen Republican legislators issued a press release last night encouraging the state to return or not accept any federal money associated with ObamaCare and the controversial 'early innovator' grant. 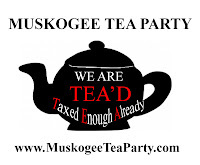 This was apparently prompted by the backlash and uproar over the House passage of HB2130. Ironically, each of the twelve legislators in the press release voted for HB2130, despite the fact that many of the points made in their press release were made by opponents of HB2130 before these twelve voted for the bill. 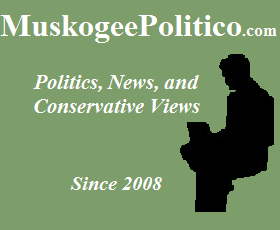 Oklahoma's leading political blogger, Mike McCarville, is pushing for U.S. Sen. Tom Coburn to run for president, and it has sparked a bit of discussion even outside of Oklahoma. The more time elapses from the announcement of the budget compromise, the worse the news gets. The CBO is now saying that in actuality, it doesn't cut $38.5 billion, it cuts $352 million. Newsmax.com is reporting that Donald Trump will announce his presidential candidacy a few days after the Celebrity Apprentice TV show finale. This on the heels of a CNN/Opinion Research GOP primary poll that has Trump tied with Huckabee for the lead at 19% nationwide (Palin was at 12%, Gingrich and Romney at 11%). All of this makes me wonder if Trump will just be the 2012 version of Fred Thompson. Gov. Mary Fallin declined to reauthorize the controversial Governor's Ethnic American Advisory Council. 'Ethnic American', meaning 'Islamic'. That was one of the most insanely ridiculous politically-correct terms I had ever heard. Three anonymous state legislators (allegedly two representatives, one senator) have launched a blog to discuss the race for House Speaker (2013-2014 term). In particular, they have focused on candidate T.W. Shannon, and his close ties to controversial-but-highly-successful consultant Fount Holland. 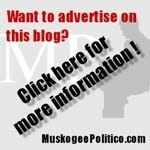 The Tahlequah Daily Press reports that Hulbert school board member Charles Thompson was removed from office Monday for failing to meet professional development requirements set by state law. School officials recently discovered Thompson had not accrued required professional development hours within his first 15 months on the board. According to state law, the board is required to make a seat vacant if the person elected to it hasn’t acquired 12 hours of professional development classes in that time frame. “I want to apologize to everybody on the board, because I have clearly dropped the ball here on this,” said Thompson. “This is not something I take lightly, and honestly, I hadn’t been keeping track of things myself. I think I got 15 or 18 hours all together, something like that. The classes I was attending, or the lectures I was attending, I thought counted toward that new-member training, and it didn’t.” Thompson said some seminars he attended did count. Thompson was asked if he had received letters from the state showing how many hours he had taken; he said that he had gotten a few letters. Read more at this link. The seat remains vacant for the time being. Thompson ran for Congress in 2010, and eventually became the Republican nominee. 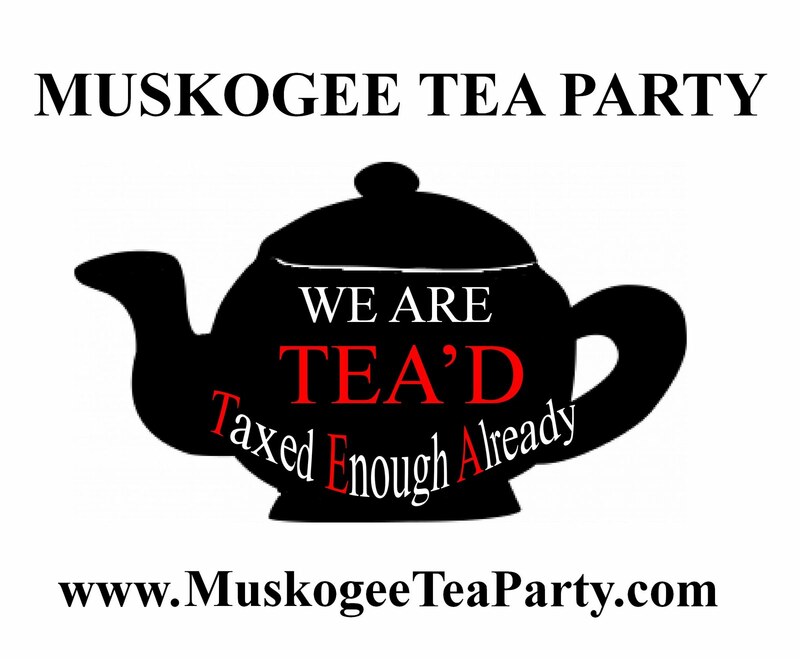 He received 43% of the vote against sitting 2nd District Congressman Dan Boren (D-Muskogee). This instance isn't the first time Thompson has had paperwork problems. As a "government shutdown" looms, in part due to Republicans determination to defund the abortion giant Planned Parenthood (and Democrats desire to keep the funding intact), stunning facts have come to light about the operations of Planned Parenthood. According to Planned Parenthood, they performed 332,278 abortions in 2009. For reference, the 2009 population of Cincinatti, Ohio, was 333,012. CNSNews.com: The 332,278 abortions Planned Parenthood performed over the 365 days of 2009 equals an average of 910 lives terminated per day--or about 38 per hour, or one every 95 seconds. Planned Parenthood spokeswoman Tait Sye recently told Bloomberg Businessweek that 90 percent of that $363.2 million came directly from the federal government or from Medicaid, a federal-state program. Thus, Planned Parenthood received about $326.88 million from federal programs in 2009. 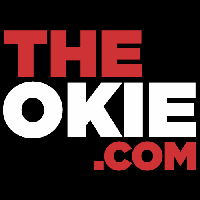 TheBlaze.com has more information at this link. By the time you finish reading this post, Planned Parenthood will have murdered another innocent unborn child. This unspeakable abomination must come to an end. Eufaula, population 2605. Home of the Ironheads. McIntosh County seat. Checotah, population 3049. Home of the Wildcats. Think they should be the county seat. Rivals in everything. And now, it would seem, rivals even to the point of election results. 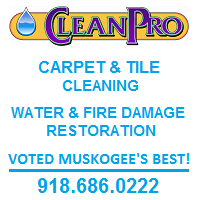 Both towns held a mayoral election on Tuesday; Checotah had four candidates, Eufaula had three. Talk about a cross-county rivalry! Former IAEA director Mohamed ElBaradei, touted by the West as a "moderate" Muslim leader, and an Egyptian presidential candidate, told an Arab newspaper that "if Israel attacked Gaza we would declare war against the Zionist regime." ElBaradei received the Nobel Peace Prize in 2005. It should be noted that the terrorists who are in charge in Gaza have once again been escalating rocket and mortar fire into Israel in the past few months. The West tends to ignore what Muslim leaders tell their own press, and instead focus on what they say in English - even thought they oftentimes are polar opposite statements. Mohamed ElBaradei, a moderate? The Muslim Brotherhood, moderates? Nope. For a more sober take on April Fools Day, here is a video and article on the national debt. Article: How well do you understand the size and scope of our national debt? We've got new figures here that put it in perspective.